In 1972, a group of 20 U.S. Army infantrymen attempted to hike the trail nonstop, starting one day ahead of the Tevis Cup ride. 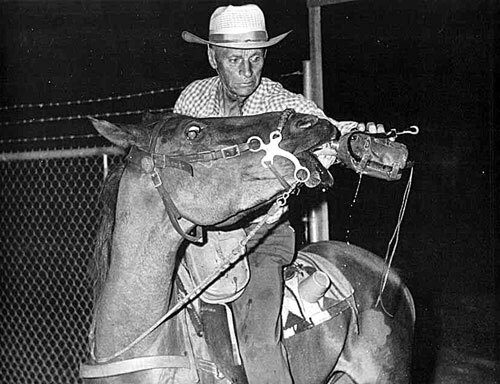 They were guided by a local horseman, Jim Larimer (who would finish Western States seven years later). Details of the hike are sketchy at best, with some rumored to have taken a short cut and Larimer reporting that several had taken rides on his horse at various points along the way. Nonetheless, seven of the 20 made it all the way to Auburn, in times between 44:54 and 46:49. 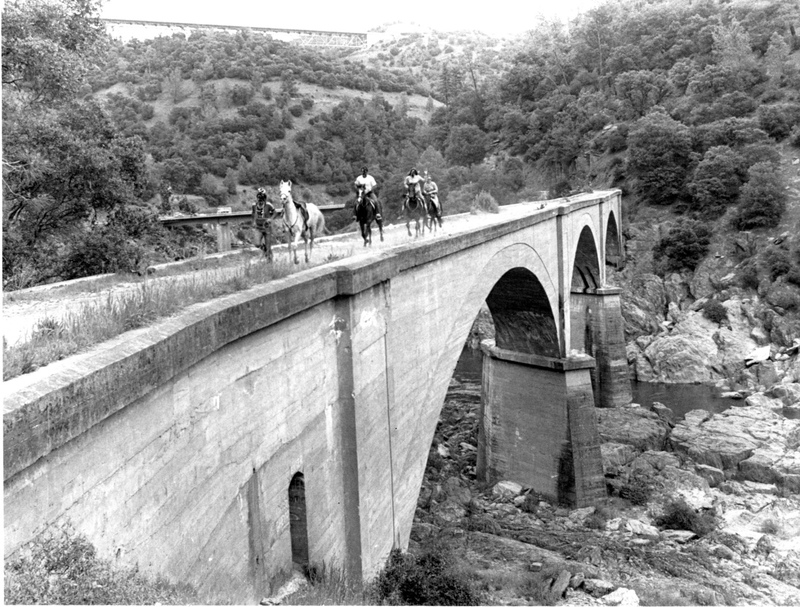 In 1974, with the inspiration and encouragement of Drucilla Barner, first woman to win the Tevis Cup and Secretary of the WSTF, Tevis veteran Gordy Ainsleigh joined the horses of the Western States Trail Ride to see if he could complete the course on foot. 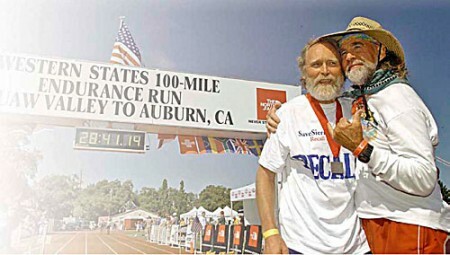 Twenty-three hours and forty-two minutes later Gordy arrived in Auburn, proving that a runner could indeed run the entire trail within the 24-hour time limit of the Tevis Cup – 100 miles in one day. In 1975, a second runner, Ron Kelley, attempted the same feat, only to withdraw within two miles of the finish with ample time remaining. In 1976, Ken “Cowman” Shirk ran the 100 miles, finishing just 30 minutes over the 24-hour mark. In 1977, 14 men from four states participated in the 1st official Western States Endurance Run, which was held in conjunction with the Tevis Cup Ride. Runners were monitored by Dr. Bob Lind at the three veterinary stops set up for the horses, and although the race organization transported the entrants gear, runners were responsible for producing all of their own supplies, except water. Three runners finished the course: Andy Gonzales, age 22, in the record-breaking time of 22:57, and Peter Mattei and Ralph Paffenbarger, ages 53 and 54, who tied in 28:36 (and the 30-hour award was born!). In the fall of 1977, the Board of Directors for the Western States Endurance Run was formed as part of the Western States Trail Foundation. It was made up primarily of the handful of runners and riders who had helped monitor the progress of the 14 pioneers earlier that summer. The Run organization later became its own entity and is now known as the Western States Endurance Run Foundation. 1978 heralded a dramatic increase in both interest and participation in the Western States Run. Culminating a year-long effort by the inspired Gang of Four (Phil Gardner, Mo Livermore, Shannon Weil, and Curt Sproul) to create an independent event, the race took place in June, a month earlier than the Tevis Cup Ride. The event mushroomed to include 21 aid stations and six medical checks, thanks to an ever-growing corps of loyal volunteers and the support of the Placer County Sheriff ‘s Communications Reserve and the Search and Rescue Unit. 63 adventurers ran the race, and the first woman, Pat Smythe, finished in 29:34. One hundred forty-three runners from 21 states and three foreign countries attempted the course in 1979. Since then, the Run has reached its full entrance quota and draws athletes from across the nation and around the world.